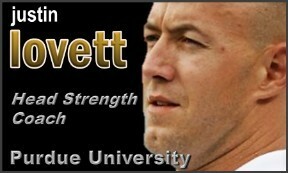 Justin Lovett was hired as Purdue’s director of strength and conditioning for football on Dec. 21, 2016. Lovett helped the Boilermakers earn a berth in the Music City Bowl in 2018 vs Auburn, following a season which saw them have huge wins over #2 Ohio State, #23 Boston College, and on the road at Nebraska. In Lovett's first season at Purdue, the team won 7 games and experienced the program's first winning season since 2011. The season culminated with an appearance - and 38-35 win - over Arizona in the Foster Farms Bowl. Lovett joined the Boilermakers after three seasons in a similar capacity at Western Kentucky. During his time with Hilltoppers, Lovett helped build WKU to back-to-back Conference USA championships (2015 and 2016) and two straight bowl victories (2014 Popeyes Bahamas Bowl and 2015 Miami Beach Bowl). Five players were selected by National Football League teams during his time in Bowling Green, including a school-record-tying three in the 2016 draft. Western Kentucky went 30-10 overall during Lovett’s time, including a 19-5 mark in CUSA play. Prior to WKU, Lovett spent two seasons with the strength and conditioning staff at Georgia. The Bulldogs posted a 20-7 overall record, played in the 2012 SEC championship game and in two January bowl games (2013 Capital One Bowl and 2014 Taxslayer.com Gator Bowl) during his time in Athens. Including first-rounders Todd Gurley, Jarvis Jones and Alec Ogletree, a total of 15 players were selected by NFL teams in his two seasons at Georgia. Lovett worked with the Denver Broncos from 2009 to 2011, starting as an intern before moving to assistant strength and conditioning coach the final two years. While with the Broncos, the team won the 2011 AFC West and was among the top five teams in the NFL in terms of having the lowest amount of practices and games missed by starters in 2009 and 2011. Denver had eight players voted to the Pro Bowl during Lovett’s time there. Lovett got his start among the collegiate ranks at UTEP from 2008 to 2009. He served as the strength and conditioning coach for Miners’ soccer and track & field teams, and assisted with football and softball. Lovett served as the head strength and conditioning coach at Grandview High School in Aurora, Colorado, from 2004 to 2008 and as the director of sports performance at Miramont Sports Center in Fort Collins, Colorado, from 2003 to 2004. Lovett was a two-sport athlete in football and baseball at the University of Findlay (NAIA) from 1995-96. He earned a Bachelor's Degree in Exercise and Sport Science from Colorado State University, and a Master's Degree in Exercise Science (Athletic Performance Enhancement and Injury Prevention) from California University of Pennsylvania. He also holds current certifications from the CSCCa (Strength & Conditioning Coach Certified), NSCA (Certified Strength and Conditioning Specialist), NASM (Performance Enhancement Specialist & Corrective Exercise Specialist), as well as from the NASE (Specialist in Speed and Explosion). A native of Beavercreek, Ohio, Lovett and his wife, Amy, have two sons: Tillman and Lyndon.